Jul.2006. Dolina Hamilton (nee MacKinnon), Ontario, Canada. Hi webmaister: The site is fabulous I have had two pals contact me since I signed the guestbook. I worked beside the first pal (Anne Calman) nee Merrilees 40+yrs ago, we have since met and keep in touch she stays not far from me. 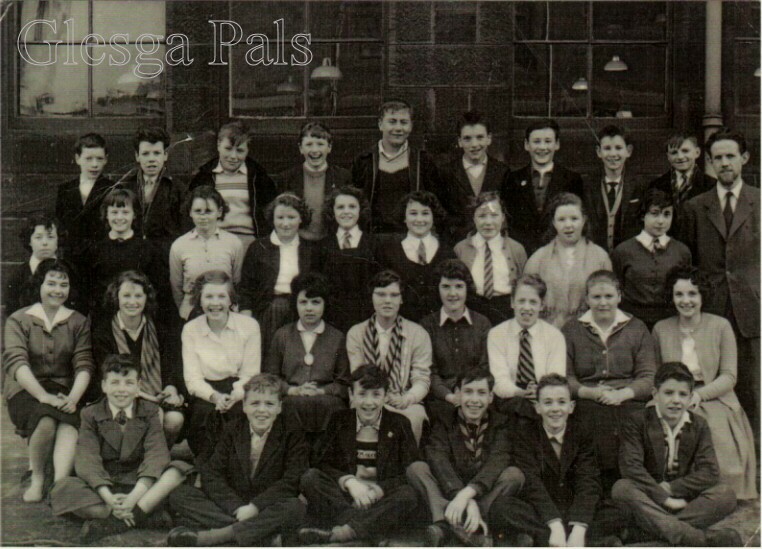 I went to school with the 2nd pal (Marion Copeland) nee McDonald she is the one who sent me the class picture I talk to her often through e-mails she stays in Glasgow..........The picture was taken at John St.Senior Secondary 1960. Thanks again I get google eyed on your site it is very addictive I enjoy every minute/hours that I am on it. Sept.2008. Betty Muir, Glasgow, Scotland. John McFarlane and this was his school photograph. Back row no. 7 – William Hendry, Front Row – no. 1 – George Dempster, Front Row – no. 3 John McFarlane. Betty Muir (Bobby Muir and Drew Muir’s mum – they were both in the 219th BB with you). Oct.2009 Dolina Hamilton (nee MacKinnon), Ontario, Canada. Hi Webmaister: I met you and Norrie at the GlescaPals Hoose Party in Toronto, what a great night (great people) and thanks for the sweeties, they brought back great memories (especially the wee flying saucer). I received an email from a school pal (Donald Howie) who is in the picture, he got my address through GlescaPals and I thank you for that. I sent a school picture to GlesgaPals a few years back and I now have some more names to be added, thanks to Donnie for providing them. John Street Sen Secondary 13/14 yrs old 1960. Donald and I went to Tureen Street School and John Street Sen Secondary, he said he sent the pictures for the GP website, I am excited about seeing them. Top Row: # 1 John Cartledge, # 3 Gordon Crawford, # 5 James Ferguson, # 6 William Irvine, .# 8 Donnie Watson, # 9 George Molde. Thanks Webmaister for fabulous memories.